Click on the ADVANCED SEARCH icon, near the top of the screen. 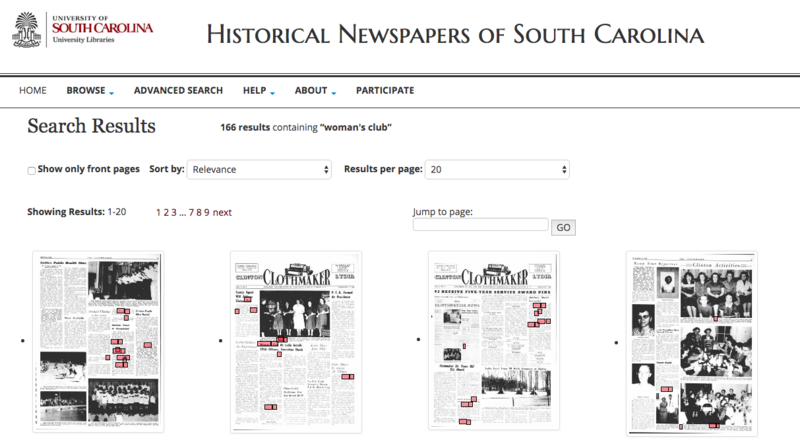 Next, select The Clothmaker from the list of South Carolina newspapers. Below the newspaper listings, you will find the Word/Phrase search box. When searching for a phrase (e.g. "woman's club"), use the box labeled pages containing these words. Use the default setting, within 5 words of each other. Next, click on the red Search button. All pages from The Clothmaker containing this phrase will appear in your results list. Select a page to view. Your search words will be highlighted in pink.